Live Well 360 is a brand of premium and highly functional gym and fitness bags. We have bags for all kinds of fitness enthusiasts be it runners, travelers, yogis, bodybuilders, athletes or gym goers. Our bags reflect the highest level of standards and help fitness enthusiasts focus on their passion and dedication for fitness. Our focus is always on fusing quality with superior design elements to make zero compromises on comfort and fitness. We lay special emphasis on creating bags that are sleek, comfortable to carry, have inspiring interiors and intuitively designed compartments for all your fitness equipment. Some of our famous gym and fitness bags include The Accel, The Backpack, The Core 2.0, The Luxx, The Robyn, and The Tote. From our first bag The Core, we have come a long way to diversify our products and offer new designs and colors to our customers. Apart from superior design and utmost quality, all our bags have straps for yoga mats, foam rollers and jackets. Also, our bags are made from the highest quality materials to be waterproof and mildew resistant. 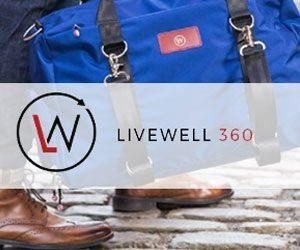 Live Well 360 ships its bags worldwide and takes custom orders for corporate, wholesale and bulk sales. Live Well 360 has been recognized for its quality and intuitive designs by fitness magazines and portals like Oxygen, Shape, Muscle & Fitness and Experience Life.